As Yerry Mina's third set-piece goal of this tournament rebounded off Kieran Trippier's head, the underside of the crossbar and then over the goal-line, a familiar wave of hopelessness will have washed over many England supporters, pulling them under the water, suffocating that faint and fragile optimism that had dared to mount in their stomach until it asphyxiated. 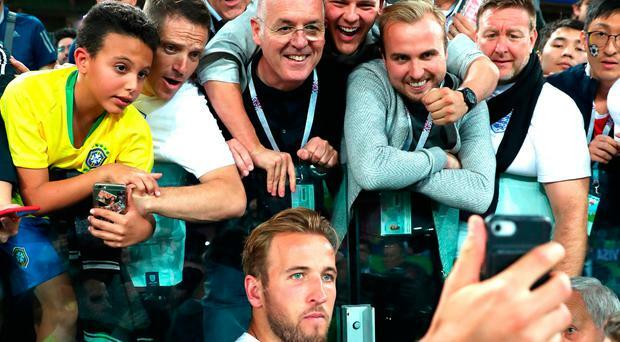 "Just when you think you've seen it all with England," said the commentary team to the millions watching at home, those away from the febrile atmosphere of the Spartak Stadium. Except we have. This was not the England national football team exploring new ground, trying out a difficult second album. This was the greatest hits. The funny thing about familiar waves of hopelessness though is that they are familiar, and in a way, oddly comforting. This was a crushing moment - a collapse that England probably did not deserve, but one they did not do enough to insure against. But to collapse you must first find yourself at some sort of height. Two years ago, this team was at its nadir. The defeat to Iceland in Nice was certainly the post-1966 tournament low point. If South Africa in 2010 was the end of the 'golden generation', 2016 was the end of their pyrite equivalent - a final goodbye to players who rarely lived up to their reputations. This crushing blow felt different. Not like the non-plussed disappointment that came with the group-stage exit in Brazil four years ago. Different from the European Championship in 2012 too, when a team that never really captured the imagination, under a manager who had been parachuted into the job at short notice, was given a free pass. The disappointment here was much more like those of the 1990s and early-to-mid 2000s, when despite the defeats, something had at least seemed possible. In those days of linear television and SMS goal alerts, England's outings at major tournaments were the closest the country came to a form of communion. A genuine hope, sometimes an arrogant expectancy, would always take hold. Those hopes would eventually be dashed, of course. But two years would pass and the same hope would be there again. There was always a semblance of belief, at the very least. But the batterings that the England team has taken in the years since 2010 seemed to have put paid to that. Yet the lyric that has been parrotted all over social media is from a song that became popular because of its bittersweet message. It was about embracing the under-achievements. Dreaming despite the disappointment. Allowing your hopes to fill with helium and float to the ceiling, in the full knowledge they could burst at any moment. The story of the England national football team had lost that blind, naive optimism over the last few years. If nothing else, by edging past Colombia and winning their first penalty shoot-out since 1996, Southgate and his players have picked this institution up from the floor and dared its followers to dream recklessly again. No doubt, too many people back in England are already getting carried away, mapping the route to the final. In that sense, football has already come home.